From the Battle of Bunker Hill to the Battle of Midway, from Vietnam to the Persian Gulf, from George Washington to Douglas MacArthur, Atlas of American Military History offers a highly visual presentation of America at war, exploring the personalities, methods, strategies, and historical contexts of each conflict. The maps and text are well integrated and complement each other nicely, treating important topics in a comprehensive and authoritative manner. Following a loose chronological framework, this accessible volume examines every significant military campaign and war in which the United States has been engaged, both domestically and internationally, from the French and Indian War up to and including the latest war in Iraq. Bountiful full-color maps enhance the insightful textual narrative. It also discusses key topics such as military methods, weaponry, and communication technology. Offering a thorough, fascinating treatment of all aspects of U.S. military history, this invaluable reference will interest students and general readers alike. 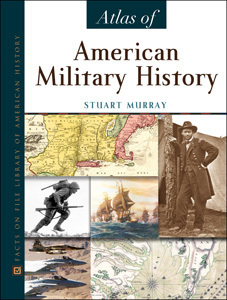 "...an attractive and well-designed atlas that traces American military history from the colonial period to the wars in Afghanistan and Iraq...well written and highly readable...a useful addition for high school libraries, public libraries, and undergraduate collections."